W.F. Paulett and Son, Inc.
Name: W.F. Paulett and Son, Inc. Comments: In 1914, William F. Paulett bought a Main Street lot in Scottsville where a blacksmith shop once stood and began construction a large building to house his lumber and hardware business. First he poured a concrete floor, one so immense in size that a group of little boys came to marvel at it later that day. Former Scottsville Mayor Raymon Thacker was one of those boys, who believed a vast mud floor lay before him as the boys all began walking across it to see their footprints. Somebody informed the owner about the boys' actions, and the next day he caught Raymond walking down Main Street. Raymon told Mr. Paulett that everyone thought it was just mud and that they didn't mean to be destructive. Mr. Paulett replied, "Well, it was concrete and you left your footprints everywhere. Fortunately it was still wet enough for us to get the footprints out except we left two right where the staircase goes upstairs. And now your footprints are left in the sands of time." Raymon said those two footprints stayed right there until the building was destroyed by fire in the 1970's. 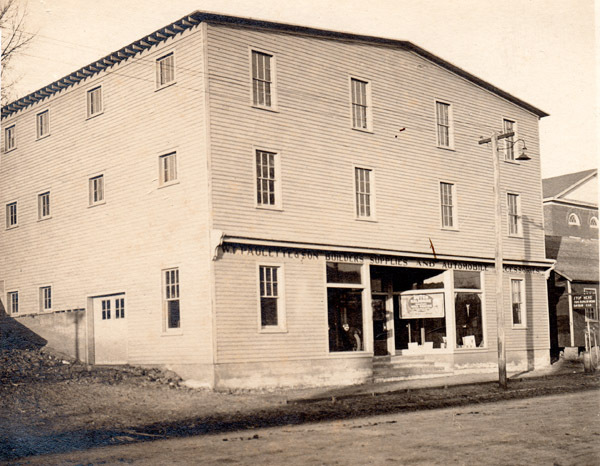 Once the construction of Paulett's lumber and hardware store was completed, Mr. Paulett purchased a couple loads of building materials and flooring and offered it for sale to the public. His son, Forrest E. Paulett, came into the business in 1919 and added a saw mill which provided lumber for the Pauletts to sell as part of their business. Shown below is a ca. 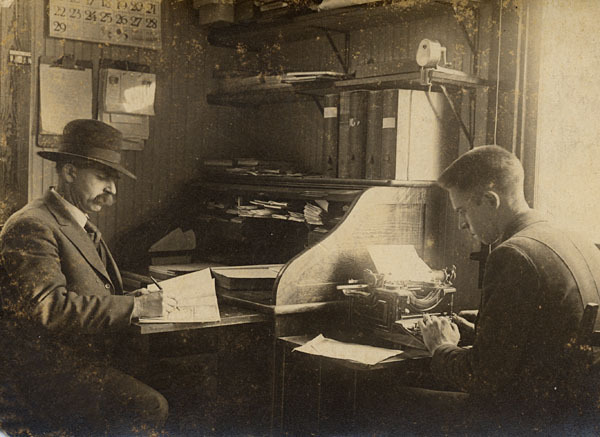 1925 photo of William F. Paulett at left and Forrest E. Paulett at right as they completed some paperwork in their office at W. F. Paulett and Son, Inc. The W.F. Paulett and Son, Inc., building was three stories in height, and each floor was accessible by truck. The first floor was where customers bought their nails and other building hardware. The second floor contained the saw mill which cut and planed the wooden boards. On the third floor, the Pauletts laid the products that were to be trucked out to its customers. William F. Paulett passed away in 1940, and his son, Forrest, took over management of the business. Forrest Paulett hired Wilson Dansey to work in the store in 1936, Marguerite Spencer and Haden Anderson in 1947, and would eventually sell the business in 1964 to these three very dedicated employees. By 1976, the Paulett lumberyard and building supply company was owned by Wilson L. Dansey of Scottsville. SCOTTSVILLE, VA -- If Scottsville had not survived four James River floods in the past eight years -- not to mention occupation by Sheridan's Raiders and Gen. George A. Custer during the Civil War -- people here might be more upset that someone now seems to be burning down the town. Even with all that, they are not exactly thrilled. "What worries me is what happens next," said Wilson L. Dansey, whose lumberyard and building supply company went up in smoke last year. "We've got somebody sick around here." Last year 32 buildings flanked the two-block Main Street in this James River town of 300 located about 20 miles south of Charlottesville. This year only 25 remain, plus three charred lots holding the ruins of Dansey's lumber business, a 140 year-old Methodist Church, and a century-old feed mill and general store. Two flame damaged houses face one fire site. The site of a burn-out Exxon Station has been rebuilt. So far, authorities say there are few clues. The fires began the night of Feb. 26, 1976, when flames roared through and destroyed an aging frame hotel and the Exxon station near the main downtown intersection. Two nights later another fire destroyed the lumber firm and the church, plus several nearby outbuildings, and heavily damaged two houses. On Feb. 28, the first anniversary of the second blaze, while the town fire department was away battling a blaze in an abandoned house at Schuyler, 16 miles away, another fire broke out. This one was in the old Scottsville Flour Mills, a mammoth four-story frame building where Caleb N. Denby and his son, Keith, sold everything from horse collars and plows to chicken feed and cow manure. "We had just gotten in our spring inventory," the older Denby said later. "There's not a thing left." The latest fire broke out about 1:30 a.m. in the rear of the building, nowhere near any electrical wiring or other logical source, and roared out of control for 3 1/2 hours. By the time the firemen got back from Schuyler, all they could do was play water on the other nearby buildings, including the converted filling station across the street where Dansey was trying to run his building material business once again. That wasn't the only problem. Scottsville's fire hydrants which had not been working for the first fires, were not working for this year's fires either. Firemen had to lay hose 60 yards across the Chesapeake and Ohio Railroad tracks to the James River for water, and then got two pumper trucks stuck in the riverbank mud. More than 100 firemen from as far away as Charlottesville eventually showed up to fight the blaze. A service station and three homes nearby were scorched but not seriously damaged. Denby, a 61 year-old retired fire control technician in the U.S. Navy, said the flour mill building and its contents were insured for about $30,000, "but we couldn't replace it all for twice that. Those were heart-of-pine beams in that building, each more than a foot in diameter. There hasn't been tiber like that around here for more than 30 years." He would have had more insurance on the building, Denby said, "but after the other fires, the rates just went through the ceiling. We just couldn't afford any more. In the wake of all the fires,there is an undercurrent of dread in Scottsville and constant rumors (apparently unfounded) of notes pinned to buildings in town concerning possible additional fires to come. A new building for W.F. Paulett and Son, Inc., was built in 1978 at its current location (127 Irish Road across from the Scottsville Shopping Center). In 1984, the W.F. Paulett and Son, Inc., business was sold to George D. Hooper and George H. Hooper. In 1986, the Hoopers partnered with the Ace Hardware Corporation, and over the years, the building space doubled for W.F. Paulett and Son Ace Hardware. In 2014, Augusta Co-op purchased the business and kept its name the same, W.F. Paulett and Son Ace Hardware. The above photos are part of the Robert Ash collection at Scottsville Museum. In 2016, Robert Ash resided in Rock, West Virginia.